A little DIY can completely change the way your house looks – from adding a fluffy rug to hanging images on the wall, all it takes is some imagination and perseverance to make your house a home. Adding that personal touch to our customer’s homes is something we love doing at Lark and Larks. Our stunning range of kitchen cupboard doors, replacement wardrobes and cupboard door handles will transform any room, helping you create the kitchen or bedroom of your dreams. Our replacement cupboard doors, wardrobe doors and door handles are easy to use and can be seamlessly installed onto existing kitchen units and carcasses. They also come in a plethora of colours and finishes. From brilliant matte white shaker styles to glossy champagnes handleless or bold black wood grain, you’ll find the perfect replacement or new doors for you. You can also utilise your dead space with our range of made-to-measure furniture, making life much easier at home. Recently, we’ve had the pleasure of helping three lovely families turn their house into a home, and we are thrilled with the results. The old, dated kitchens and bedroom have now been turned into clean, sleek luxury spaces that are warm and truly unique to the household. This beautiful kitchen looks like it comes from a film set and we’re in love with it! The family in question are thrilled with the end result after remodelling their kitchen and having a brand new one fitted – we can see why. Lark and Larks supplied the whole kitchen to the family who live in London. The shining white solid quartz kitchen worktops go flawlessly with the Welford handleless kitchen cupboard drawers and doors. The kitchen island looks out to wide opening doors, making it the perfect view to wake up to of a morning. The placement also makes dining alfresco so much easier. 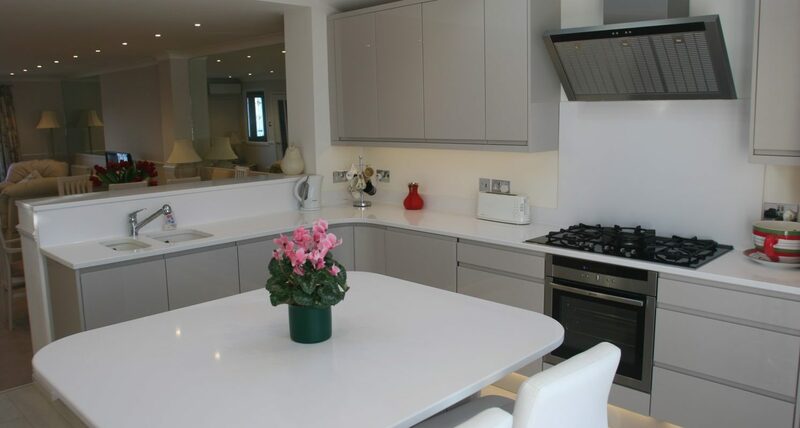 This kitchen is a perfect example of just how lustrous and sophisticated high gloss can be! This beautiful kitchen looks like it comes from a film set and we’re in love with it! 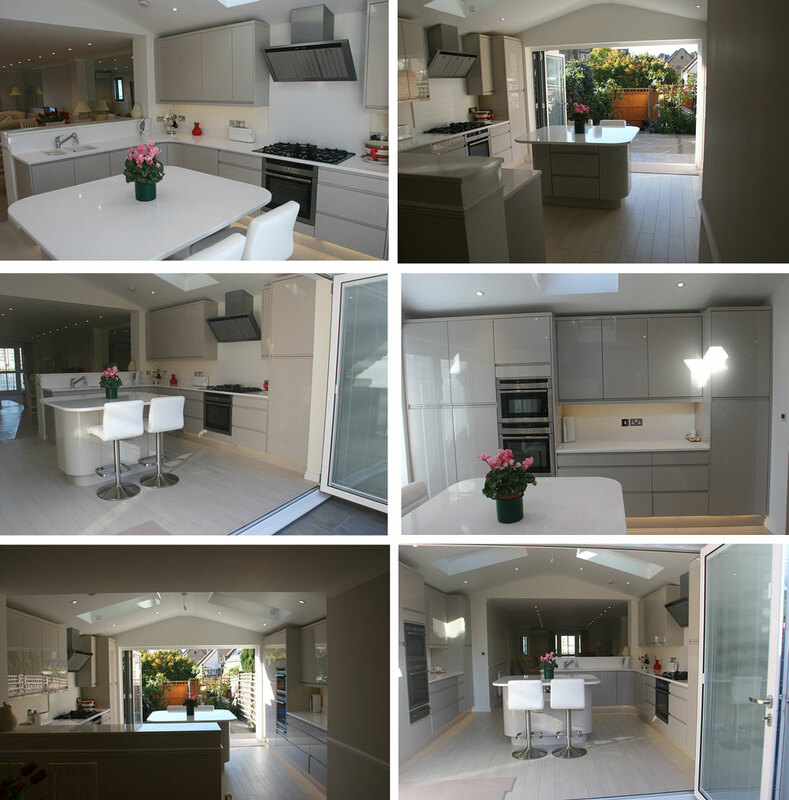 The family in question are thrilled with the end result after remodelling their kitchen and having a brand new one fitted – we can see why. Lark and Larks supplied the whole kitchen to the family who live in London. The shining white Solid Quartz kitchen work tops go flawlessly with the Welford handleless kitchen cupboard drawers and doors. The kitchen Island looks out to wide opening doors, making it the perfect view to wake up to of a morning. The placement also makes dining alfresco so much easier. This kitchen is a perfect example of just how lustrous and sophisticated high gloss can be! The bedroom is one of the most important rooms in a house – after all, it’s where we all go to unwind, spoon our loved one and sleep. It’s fair to say that enough time isn’t spent just relaxing in the bedroom, but it doesn’t mean that it doesn’t deserve a little TLC. If you’re still not convinced, then have a look at this gorgeous, unique made-to-measure bedroom wardrobe and bedroom dresser. 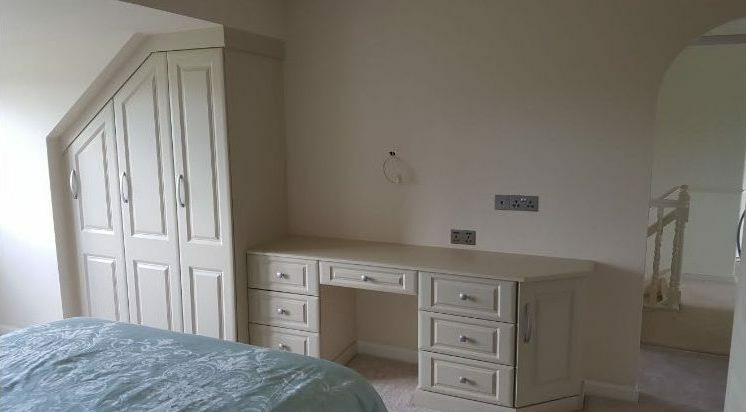 The sloping doors help to utilise what was once dead space in the bedroom, and the style of the cream coloured dresser drawers complement the shaker aesthetic of the fitted bedroom wardrobe. The only thing this sanctuary is missing is a mirror above the dressing table! At Lark and Larks, we love seeing your house turn into a home. If you’ve got any photos of your own DIY projects or you’ve got a favourite then let us know in the comments below. For advice or help with your kitchen or bedroom renovations, do not hesitate to get in touch with Lark and Larks on 0121 788 2810 or via our enquiry form.